Canadians will celebrate Tax Freedom Day on June 5 this year, three days later than 2009, according to the Fraser Institute’s annual Tax Freedom Day calculations. Tax Freedom Day is a clear and easy-to-understand representation of the amount of tax the average Canadian family must pay to all levels of government. If Canadians were required to pay all of their taxes up front, they would have to pay each and every dollar they earned to governments prior to Tax Freedom Day. To highlight the wide array of taxes imposed on Canadians and to celebrate Tax Freedom Day, the Fraser Institute has produced a new humorous music video for 2010, available at www.youtube.com/user/FraserInstitute and www.fraserinstitute.org. Even though Tax Freedom Day arrives three days later this year than in 2009, it would arrive much later if governments had to cover current expenditures with current taxation instead of deferring the tax burden by running deficits. “The significant deficits racked up by the federal and provincial governments as they attempted to stimulate the economy must one day be paid for by taxes and should therefore be considered as deferred taxation,” said Niels Veldhuis, Fraser Institute senior economist and co-author of the report, Canadians Celebrate Tax Freedom Day on June 5, 2010. Fifteen of the 25 additional days are due to the federal deficit and the remainder to the provincial deficits. 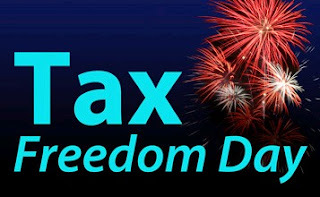 The reason Tax Freedom Day falls on June 5 in 2010, three days later than 2009, is primarily the result of Canada’s improving economy as the country emerged from recession. When the economy recovers and incomes increase, a family’s tax burden tends to increase to a greater extent. That is mainly because household consumption increases, which results in an increase in the amount of sales and other consumption taxes paid by Canadian families. However, Veldhuis points out that several provinces also increased taxes in 2010 which contributed to the later Tax Freedom Day. For example, Quebec increased several taxes (such as gas and mining taxes) and introduced a new health tax in 2010; British Columbia increased its health tax (Medical Services Plan premiums); Saskatchewan increased tobacco and alcohol taxes; Manitoba increased tobacco taxes; and Nova Scotia increased income taxes and its sales tax rate. In 2010, the average Canadian family (with two or more individuals) will earn $92,754 (which includes not just wages and salaries, but interest, dividends, private and government pension payments, old age pension payments, and other transfers from governments) and pay a total of $39,141 in taxes, for a total tax bill amounting to 42.2 per cent of its income. The total tax bill for the average Canadian family will increase by 3.8 per cent ($1,441) between 2009 and 2010. By comparison, income for the average Canadian family will increase by just 2.0 per cent ($1,816). The largest increase among the myriad of taxes came in the form of income taxes, which increased $634 for the average Canadian family while sales taxes jumped by $378. “Canadians pay a litany of taxes including income taxes, sales taxes, property taxes, health taxes, social security taxes, gas taxes, and many more,” Veldhuis said. Tax Freedom Day varies from province to province, depending on the taxation levels of provincial and local governments. Alberta continues to enjoy the earliest Tax Freedom Day on May 19, followed by New Brunswick and Prince Edward Island on May 26, then Manitoba on May 30. Next comes Ontario (May 31), Nova Scotia (June 4), British Columbia (June 5), and Quebec on June 7. Newfoundland and Labrador has the second-latest Tax Freedom Day, June 12, surpassed only by Saskatchewan, where Tax Freedom Day falls on June 16. All Canadian provinces, except Newfoundland and Labrador, experienced a later Tax Freedom Day in 2010 than in 2009. As a result of significant tax increases enacted in its 2010 budget, taxpayers in Nova Scotia celebrate Tax Freedom Day seven days later than in 2009, the largest increase in Tax Freedom Day among the provinces. Several provinces, including Newfoundland and Labrador and Saskatchewan, have significant natural resources which provide the provinces with royalties. However, there is an ongoing debate whether natural resource royalties are actually a tax. If natural resources royalties are excluded from the Tax Freedom Day calculations, Tax Freedom Day is 22 days earlier in Newfoundland and Labrador, nine days earlier in Saskatchewan, seven days earlier in Alberta, and three days earlier in British Columbia. “There’s no doubt our taxes pay for some essential government services. But the debate Canadians need to have is: are we are getting value for our tax dollars? In order to discuss that question in a rational way, we need to have a clear idea of the price we pay for government services. In other words, what is our total tax bill?” Veldhuis said. As is the case every year, Tax Freedom Day calculations are based on forecasts of personal income, and on federal and provincial budget tax revenue. When final revenue numbers become available at the end of each fiscal year and personal income data are updated by Statistics Canada, we revise our Tax Freedom Day calculations for previous years.